Dynast Seafood Restaurant seems to be a preferred venue for political candidates raising dollars over dinners. Sometimes a candidate has to spend money to make money. And, so far, Madison Nguyen has done both at a recent dinner. In her mayoral campaign kickoff event, the vice mayor shelled out about $16,000 at San Jose’s Dynasty Seafood Restaurant. Nguyen felt she owed big hitters a “decent meal” at the very least, and apparently the checks went just right of the soup spoon. Her campaign has already surpassed $100,000 in contributions, less than two weeks into the race, Nguyen said. 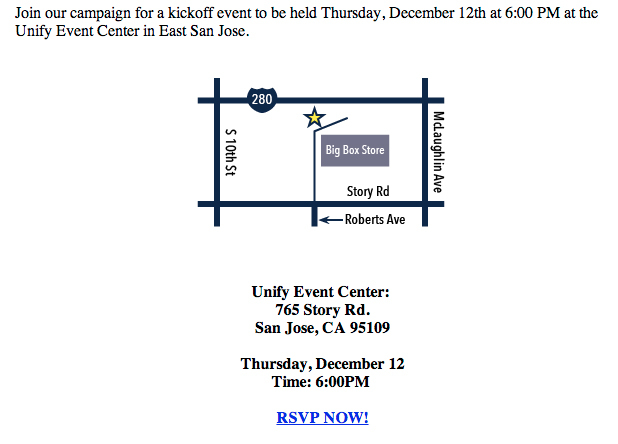 State Assemblymember Paul Fong, who is running for San Jose’s District 1 council seat, also held a fundraiser at Dynasty—except he oddly chose its Cupertino location. A Fong supporter told Fly that the termed-out legislator went beyond the city limits because he knows the restaurant owner and there were space concerns. But an employee at the Cupertino establishment told Fly that both locations hold about 600 people and the restaurants share the same owner. County Supervisor Dave Cortese also held a kickoff event last week, but it seems he hasn’t gone to serious arm-twisting yet. Dishing up inexpensive burgers and barbecue, Cortese said, several hundred attendees showed up to the Unify Event Center in San Jose to wish him well, with a few here and there toting checks. Perhaps more interesting than the event itself was Cortese’s invitation, which included a map that noted the address was near a “Big Box Store.” The reason: Cortese treats his Walmarts like Voldemort. “I don’t have a lot of respect for Walmart in terms of how they treat their employees,” he said. “It was personally my decision to mark it on the invitation that way.” Fly’s cool with that, but let there be no doubt it’s election season when firm stances are taken on the store that must not be named.